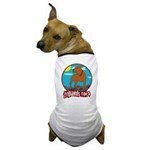 Two new three legged Pit Bull dog t-shirt designs were inspired by canine cancer hero Trouble. 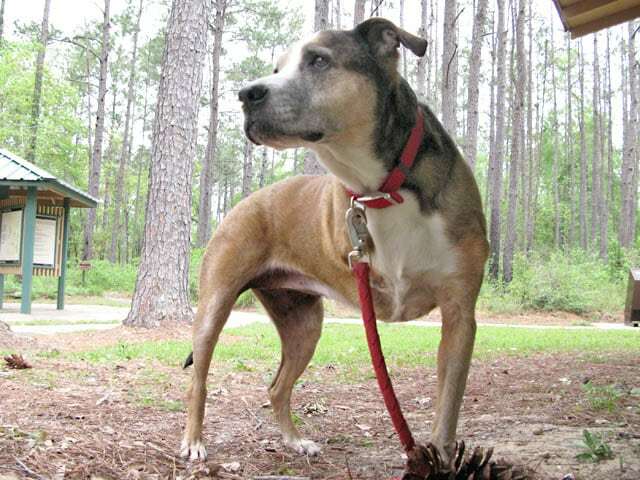 While sweet Miss Trouble went to the Rainbow Bridge in March, her spirit continues to shine on and help others with plenty of posts from hugapitbull in the Tripawds discussion forums. 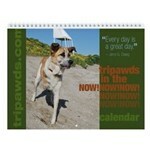 We were fortunate to meet Trouble and uploaded another video with her pack when we met again the following year. 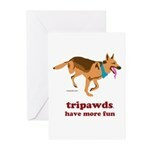 Her 27-month survival on three legs after a front leg amputation due to osteosarcoma proves that Tripawds Rock! 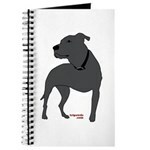 Stay tuned for new rear leg Tripawd Pittie designs coming soon. 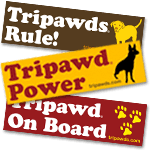 Or, browse all Tripawds designs available now! I love the colorful design! Trouble is a hero indeed! Love the new design, and can’t wait for the rear-leg one. 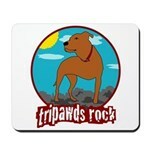 Then, I can promote my two favorite causes with one shirt – tripawds and the pit bull breed!!!! Thanks! 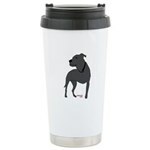 🙂 You can see the new rear leg tripawd pit bull t-shirts in the Tripawds Gift Shop! We’ll be announcing them here soon.